The debut self-titled album from Future Elevators makes a strong case for keeping your eyes open for new bands from, perhaps, unlikely places. Birmingham, Alabama probably does not come quickly to mind when thinking of places to find good indie pop bands. You more likely think of it as a place for southern rock, Americana, Gothic folk, and country rock. And of course you will find quality music in each of those channels in Birmingham. But multi-instrumentalist and creative engine for the project Michael Shackelford improves the city's rich musical tapestry with a brand of indie pop that takes new wave, Krautrock, folk and chart pop and gives it a futuristic but eminently ear-friendly gloss. This album goes down easily and deserves repeats. And if you make playlists of your music, "Modern World" will be on it. But "Losing Sleep" and "Alabama Song" may end up being challenging for favorite status for different reasons. In addition to Shackelford, Future Elevators are Ramy Noureddini, Robert Wason, Matt Devine, and John-Mark Dorough. The album is out now on Communicating Vessels in CD, vinyl and digital formats. Brisbane power pop trio Babagnouj is proudly DIY and independent. And we can only assume that they want it that way, because when you have three talented songwriters, an infectious guitar pop sound and are this easy on the eyes, I'd expect that even in these austere times in the music industry there could be a good fistfight among A&R types to earn the chance to sign this band up. Their plans for this year include three EPs and a number of live shows (check out their Facebook for dates and venues). Their big-hearted, big-voiced pop sound is showcased again on their latest single, "Do Rite With Me Tonight". Love those drums! A big dose of soul in a pop-rock wrapper -- to my ears "Memory Man" is a warm breeze on a cold day, a shot and a half of whisky at the end of a long day, a hot kiss after a long absence. The guitars have sharp edges and a big, swaggering roll at the shoulders. The vocals tug at your heart like good soul should. Juke Jaxon is the provider, and based on this song the UK duo of Jack Moore and Ben Hawthorne worth keeping in mind. I seems to me that there has been no shortage of hyphenated psychedelia lately. You know, psychedelic garage, psychedelic electro-pop, psychedelic surf and so on. And that is just fine, but then an album like It Calls On Me comes into your life, and you are reminded just what pure psychedelic music is. A product of Doug Tuttle, formerly of Mmoss, in his second solo effort. The record offers nine songs with folk-rock underpinnings, splashes of country, dreamy sun-baked atmospherics, hushed harmonies and the intricate layers of guitars that provide the core of psychedelic pop (yes, a hint of hyphen from me) in the '60s-'70s heyday of the genre. You'll find a bit of Kurt Vile, CSN&Y, the Byrds, Laurel Canyon bliss, and Fairport Convention DNA here. But the triumph here is that the overall effect isn't imitation of others, but a man telling stories in a well-mastered voice. And for the gem of a record within the record, the three song sequence of "Falling To Believe", "On Your Way", and "Saturday-Sunday" is divine. In fact, I've replayed it a few times writing this post. In addition to Tuttle, the band is Justin DeArmitt, Jesse Gallagher, and for stage performances, Noah Bond. It Calls On Me is out now via Trouble In Mind Records. Emotional - Ahh…The Name Is Emotional, Baby! Brian Wakefield has been releasing albums as Emotional for a few years now. All too quietly, in my opinion. The dude has a way with stitching together a song that hits my musical and, well, emotional buttons in a manner that leaves me happy and satisfied. Wakefield has been part of San Francisco's underground music scene for over fifteen years. He is the head honcho of Death Records, and was a member of Melted Toys, as well as contributing to other projects. But it is as Emotional that his unique and appealing brand of dream pop is best expressed. 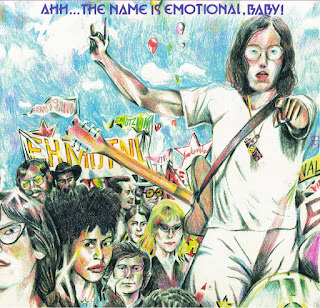 Emotional's debut LP is Ahh ... The Name Is Emotional, Baby. It is dream pop that begins with a nostalgic melodic base and then builds an aural collage with retro and jangling guitars, bright synths, woozy soundscapes and touches of '80s new wave, folk and California country, soul, and psychedelia. The hooks are as smart as any to be found on the mainstream pop charts, but are surrounded by textural layers that the hired gun songwriters can't be bothered to craft and their listeners don't appreciate anyway. It is warm, eminently accessible and relateable, and stands up well to repeated listens. A couple of representative tracks are below, but I encourage you to visit one of the Bandcamp pages offering the album to listen to the entire album. It might be the most consistently joy-producing set of songs you've heard this year. If you only have time for one, I recommend "Lies". The distribution of Ahh ... The Name Is Emotional, Baby is somewhat unusual. Eight labels have joined together to release the album. So you have your choice of Burger Records, Danger Collective, Death Records, Empty Cellar, Gnar Tapes, Grabbing Clouds, Little L, and Plastic Response. We have linked several below.